One of the original goals of the former Theresa's Haunted History of the Tri-State website was to provide readers with an ACCURATE and well-researched depository of haunted locations throughout West Virginia and beyond. While the site is going through some transitions, new additions to that list will be posted here! 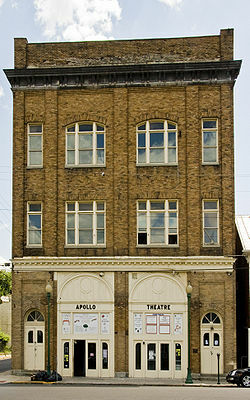 The Apollo Theater was built in downtown Martinsburg in 1913. A collaboration between local architect Chapman E. Kent and nationally known Reginald Geare, the theater broke ground in April of that year and officially opened on January 19th, 1914. 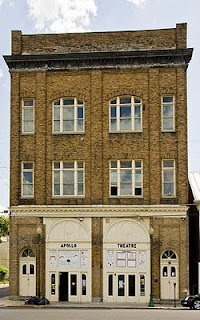 The Apollo is distinctly different from other theaters of the time period in the fact that although vaudeville shows were performed there regularly, the theater was specifically built in order to host the new motion picture craze sweeping the nation. The first round of expansion and alterations came in 1920, and were overseen by Geare himself. Further improvements came in 1927, as the theater transitioned itself from the era of silent films into the era of the "talkies" by installing a sound system. Today, the theater hosts mainly stage productions. During the 1920s, the theater was managed by a man by the name of Charlie. Many believe Charlie still sticks around. Visitors and actors alike often report smelling the strong scent of cigar smoke right before performances, especially during the autumn season. Strangely, though, Charlie doesn't seem to be confined to the theater. A woman renting a nearby apartment noticed one day that while looking out the window, she could see the image of a man outside. The man was wearing a fedora pulled down low over his eyes, and had his jacket collar pulled up. Although the man was hunched over, she could still plainly see that he was smoking a cigar. Thinking that he was an actor from the Apollo's latest production, she was astonished to see him disappear before her eyes...prompting her to seek the advice of a local ghost hunter. She was informed that she had just witnessed the ghost of "Charlie," who in life, loved to stretch his legs by taking a quick stroll around the block from his beloved theater. At some point quite a long time ago, a crew member fell from the cat walk onto the stage and was killed. I've been in the basement; which is ultra spooky. Some weird energy there. A lot of people have reported thing brushing against them in the rest rooms. Also the entrance to the catwalk from one of the upper ballrooms has a lot of activity. Awesome! Thanks for sharing that extra information! Abandoned Property Leads to Legends and More!